As rosacea progresses, other symptoms can develop such as permanent redness, red bumps (some with some pus), red gritty eyes, burning and stinging sensations, small blood vessels visible near the surface of the skin, and in some advanced cases a bulbous nose. The disorder can be confused and co-exist with acne vulgaris and/or seborrheic dermatitis. People that are fair-skinned are disproportionately affected. Rosacea affects both men and women of all ages, but middle-aged women are more susceptible because of hot flushes caused by menopause. There are four identified rosacea subtypes1 and patients may have more than one subtype present. 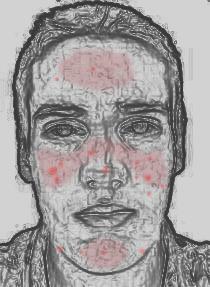 Erythematotelangiectatic rosacea: Permanent redness (erythema) with a tendency to flush and blush easily. It is also common to have small blood vessels visible near the surface of the skin (telangiectasias) and possibly burning sensations. Papulopustular rosacea: Some permanent redness with red bumps (papules) with some pus filled (pustules), this subtype can be easily confused with acne. Phymatous rosacea: This subtype is most commonly associated with rhinophyma, an enlargenent of the nose. Symptoms include thickening skin, irregular surface nodularities, and enlargement. Phymatous rosacea on appear on the nose, chin, forehead, cheeks, and ears. Small blood vessels visible near the surface of the skin (telangiectasias) may be present. Ocular rosacea: Red, dry and irritated eyes and eyelids. Some other symptoms include foreign body sensations, itching and burning. The precise pathogenesis of rosacea still remains unknown, but most experts believe that rosacea is a disorder where the blood vessels become damaged when repeatedly dilated by stimuli. The damage causes the vessels to dilate too easily and stay dilated for longer periods of time or remain permanently dilated, resulting in flushing and redness. Immune cells and inflammatory mediators can leak from the microvascular bed causing inflammatory pustules and papules, especially with those with papulopustular rosacea. Rosacea has a hereditary component and those that are fair-skinned of European or Celtic ancestry have a higher genetic predisposition to developing it. Women are more commonly affected but when men develop rosacea it tends to be more severe. People of all ages can get rosacea but there is a higher instance in the 30-50 age group. The first signs of rosacea are said to be persisting redness due to exercise, changes in temperature, and cleansing. Triggers that cause episodes of flushing and blushing play a part in the development of rosacea. Exposure to temperature extremes can cause the face to become flushed as well as strenuous exercise, heat from sunlight, severe sunburn, stress, cold wind, moving to a warm or hot environment from a cold one such as heated shops and offices during the winter. There are also some foods and drinks that can trigger flushing, these include alcohol, foods high in histamine and spicy food.